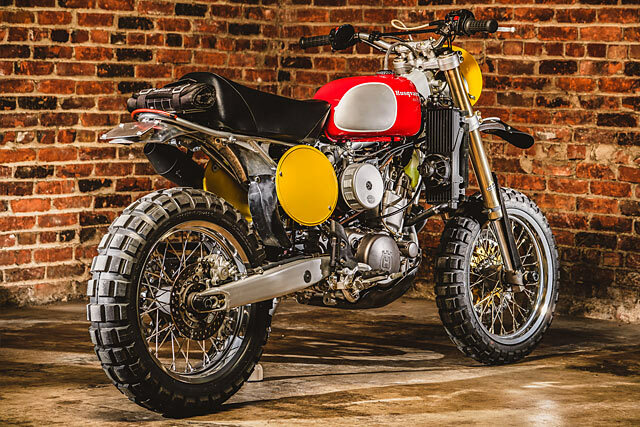 Provenance; a word usually reserved for the fine art connoisseurs amongst us, but recently it proved the difference between a motorcycle selling for less than two grand and a quarter of a million dollars. That particular bike was Steve McQueen’s very own Husqvarna 400 Cross that he rode in the groundbreaking classic, On Any Sunday. 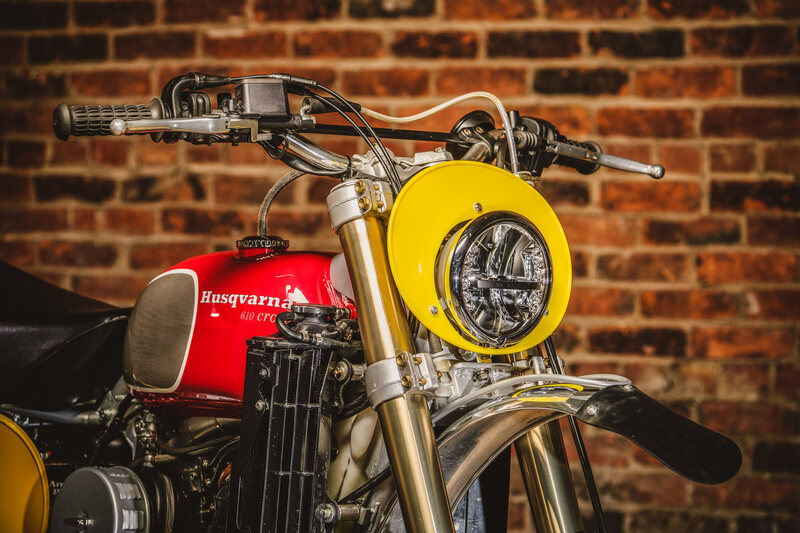 But rather than bid at auction, another wise collector with four Hageman Motorcycles already in his garage decided to go straight to the source and have his custom tailor-made. 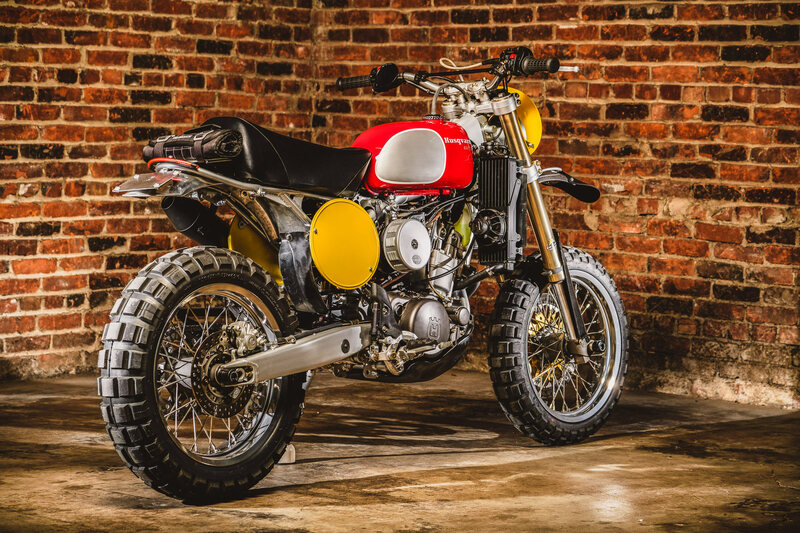 The result is this incredible union of old and new, a thumping 2007 Husqvarna SM 610 fused with all the nostalgia and charm of the very collectible 400 Cross. 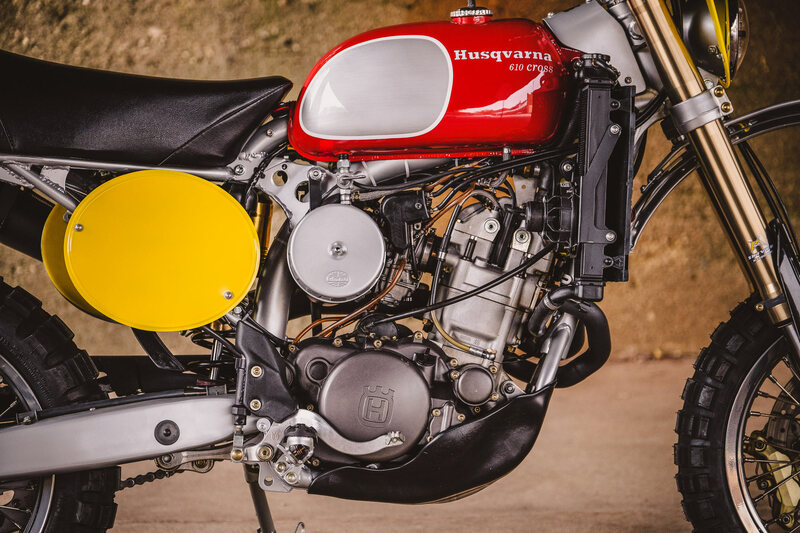 The McQueen bike had previously sold for just $1500 ten years ago, but now with the right paperwork to prove the link to its famous owner it fetched the second highest amount ever paid for a two-stroke. 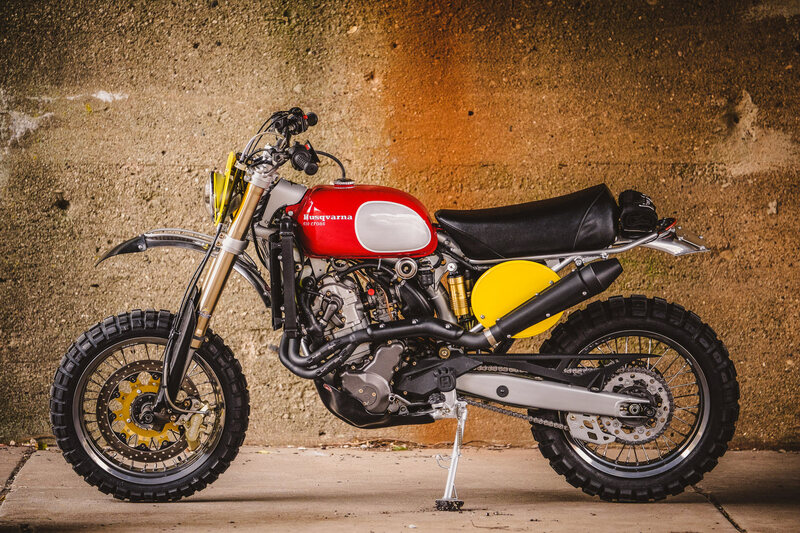 “I’ve always been both a Husqvarna and a Steve McQueen fan, the On Any Sunday movie only reinforced that. 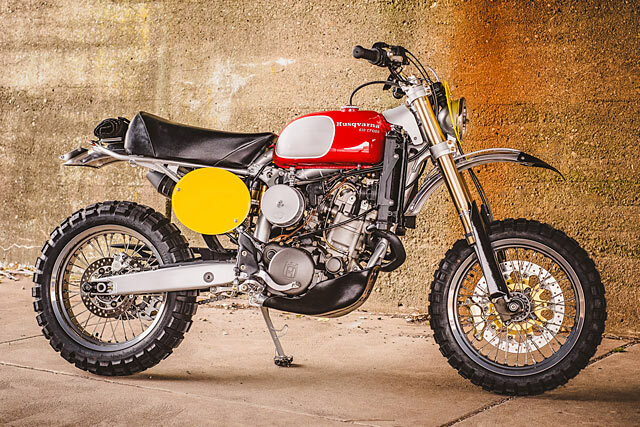 To me though, those are the bikes in my dreams, not the modern plastic ones. Obviously the new plastic ones are much better, so why not combine the beauty of one with the performance of the other?” smiles Hageman. Luckily for the master builder, a very good client from the West Coast gave Greg a call to see what ideas were kicking around in his head. When he mentioned the possibility of an old and new Husky marriage, the dream client was all ears. 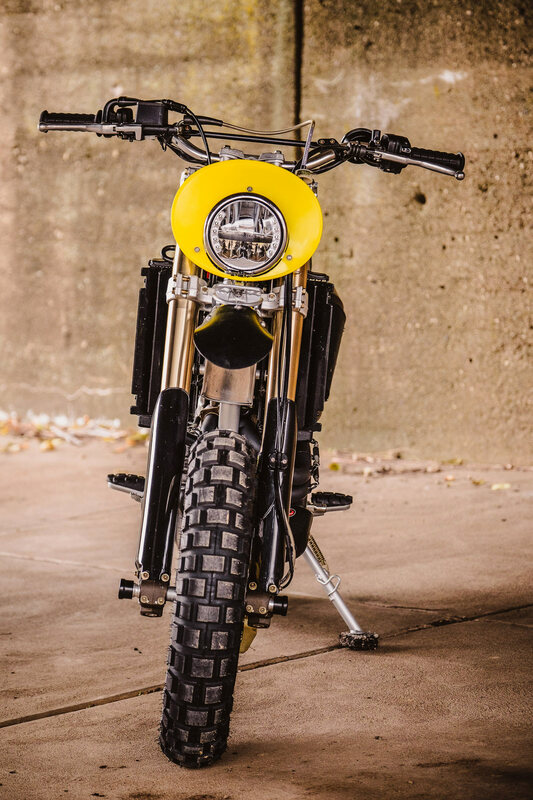 But not only would he make it his fifth Hageman Motorcycles build, he’d also leave Greg unencumbered and free to make all the decisions. 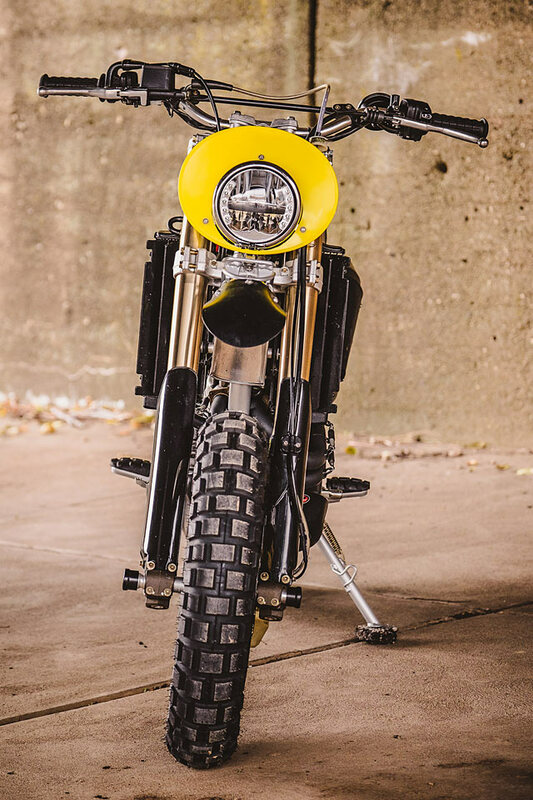 To get things underway Hageman first sourced a 2007 SM610; the street legal model makes registration less of a challenge and being the last with a carburettor would make the tank swap a little easier. 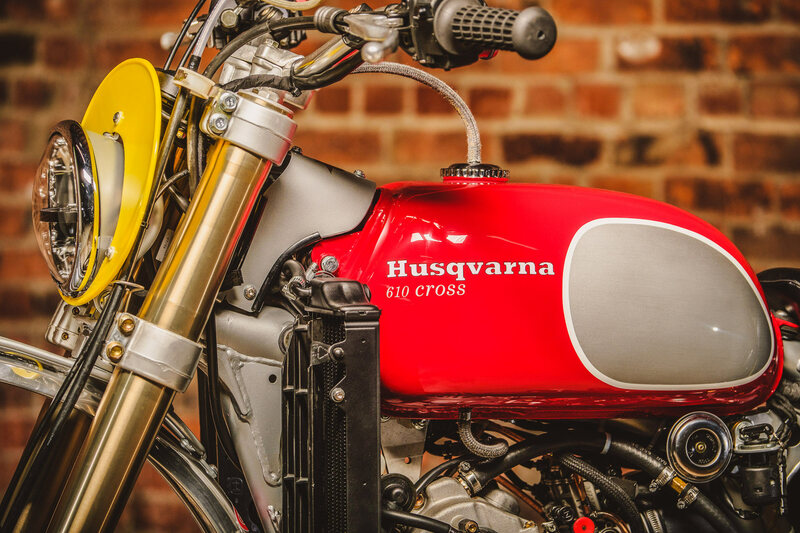 With one half of the pairing secured Hageman went shopping again, “I basically purchased most of a 400 Cross, from the tank back, including the frame, seat, and fenders. Then keeping all of that original, grafted onto the 610, keeping measurements the same as the 400.” The tank looks right at home and the new paint and graphics capture the feel of the period with their own signature touch. The transition from modern main frame to classic rear end is flawless, Hageman even managing to replicate the gap between seat and tank like the original. Beyond the classic black cushion with its generous padding there is also a little help should you get stuck out in the cold. “You’ll notice I’ve installed a Velomacchi tool roll on the rear fender, thanks to them and their support for my builds, they build great products and am glad to represent,” enthuses Greg. 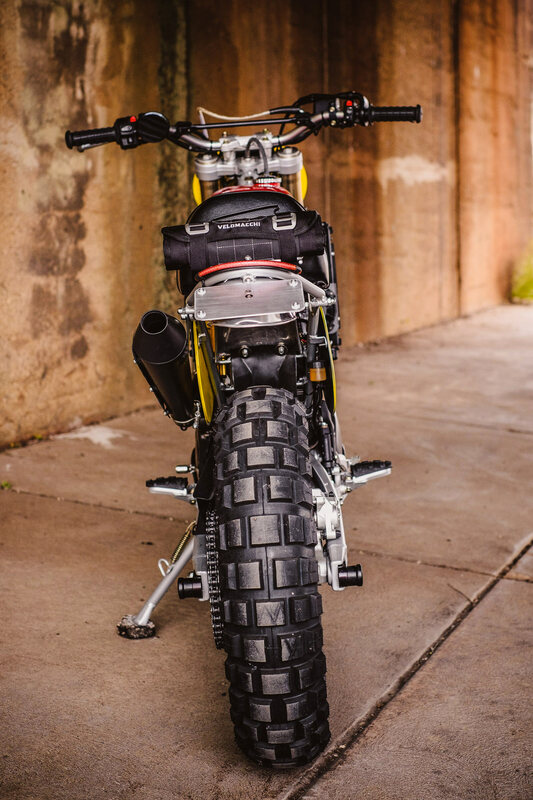 While offsetting the rear mud catcher is an enormous front fender complete with rubber flap like the bikes of old. 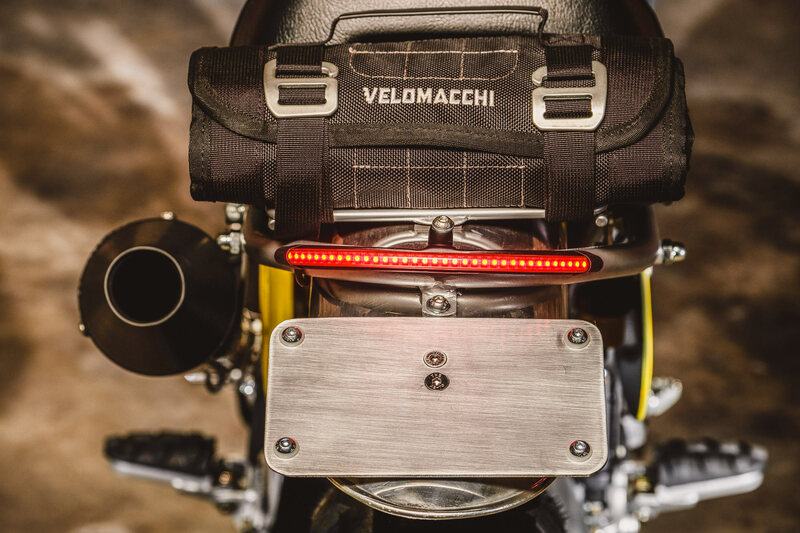 The vintage yellow number plates keep the theme flowing while an LED headlight from BikeMaster with integrated turn signals ensures crisp lines. 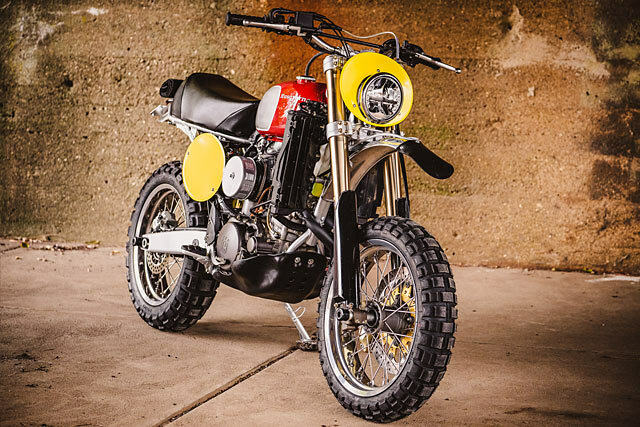 But the conversion from new to old wasn’t all plain sailing as Greg explains, “I wanted this bike to retain as much of its stock parts as possible, including radiator hoses, for simple serviceability. The radiators themselves had to be modified, tilted and spaced, but the rest of the cooling system is original.” It’s clear this is a bike built to blast with a Hyde Racing skid plate to protect the engine and axle sliders installed front and rear in case the McQueen inspired enthusiasm with the throttle sees the bike go on its side. 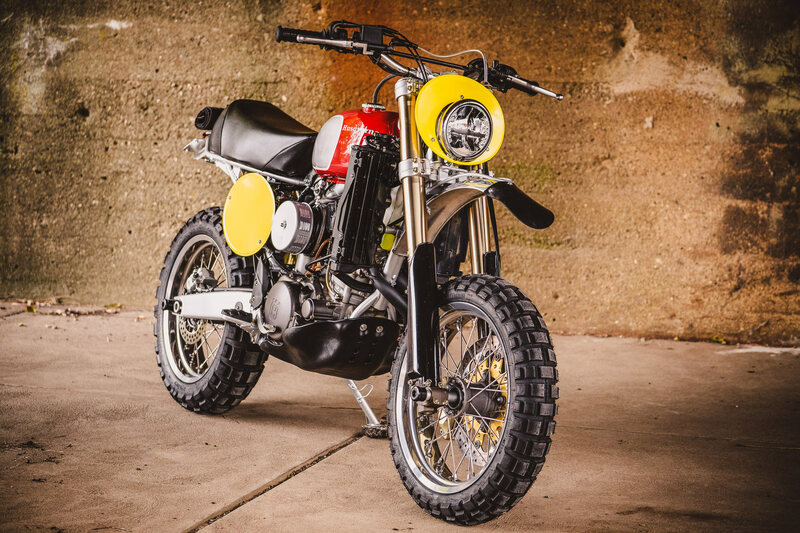 Just like the 400 Cross the newer Husky is a big single, but even with two extra strokes per cycle it’s still packed full of character. A balance shaft does its best to reduce vibration of the 576cc as it pulls hard from low in the revs and keeps going where most singles give up. Fuel is provided by the ever versatile Keihin FCR carb but Greg has done a brilliant job of adapting a vintage air cleaner to get the 400 look. Likewise the exhaust takes the stock elements and improves on them with the enormous factory can dumped for a reverse cone muffler, all blacked out and shielded. 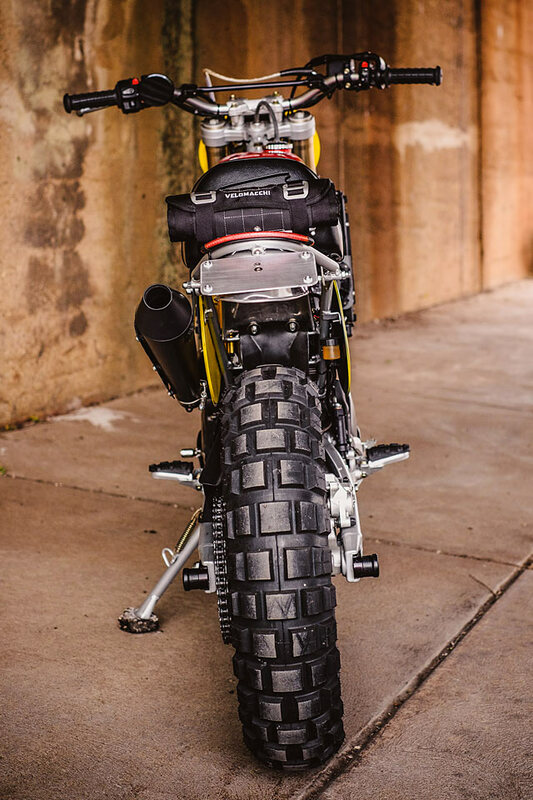 Coming stock from Husqvarna with 17 inch rims, Hageman explains the rationale for leaving them in place, “I had considered swapping for 18” and 19” hoops, but the optional street tyre selection would be very limited. 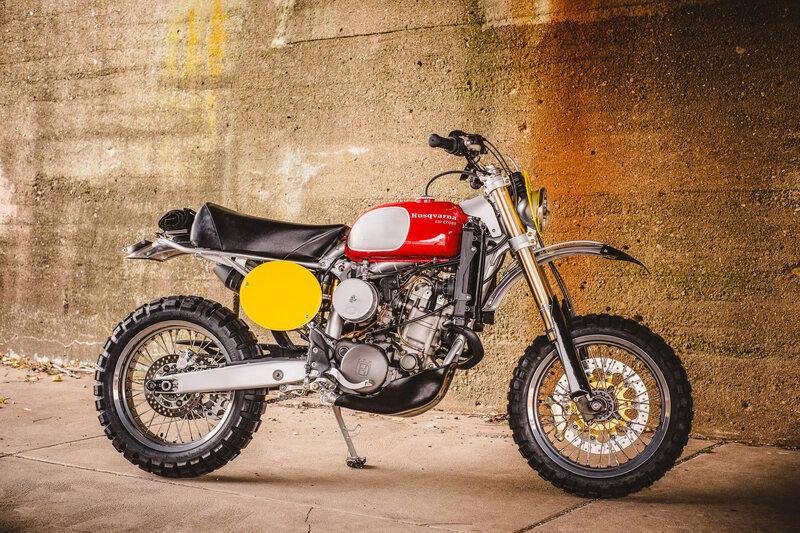 With 17s, there’s a wide range of options of both dual sport and road tires.” Utilising that choice a set of Continental Twinduro TKC80s were selected for their ability on and off-road, with a 120 section up front and a beefy 150 to put the power down. Calling a halt to the party is the factory fitted Brembo combination, with a 4 caliper 320mm front providing plenty of bite. The standard suspension is no less impressive, race winning Marzocchi 45mm inverted forks are retained, albeit restored so they are factory fresh. While the rear Sachs shock is just as good a piece of kit with a full array of adjustment, including high and low-speed damping. 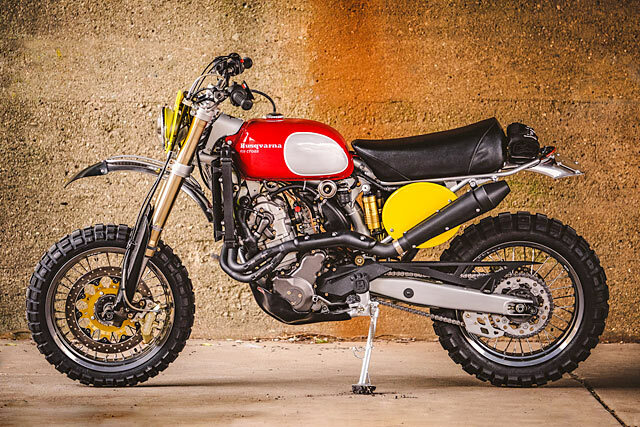 Finally clamped in the risers the vintage crosser like bars and old school grips complete the stunning transformation from modern motard to offroad overlord. 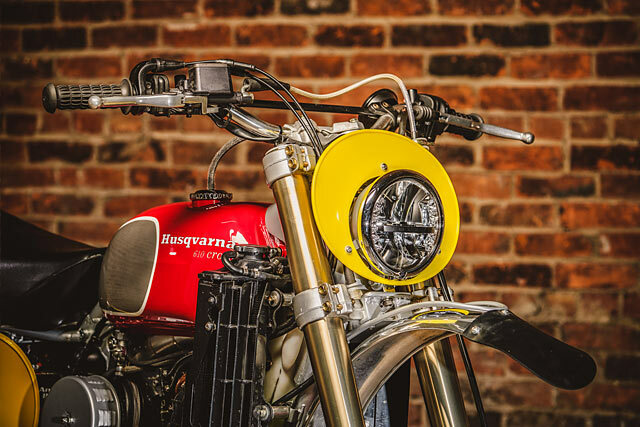 Now in 50 years should an auction house go searching for the provenance of this incredible machine, there will be no doubt that this is the real deal Hageman Motorcycles custom creation, from a man who’s been at the vanguard of the current renaissance!